Hosting your own Harry Potter birthday party? 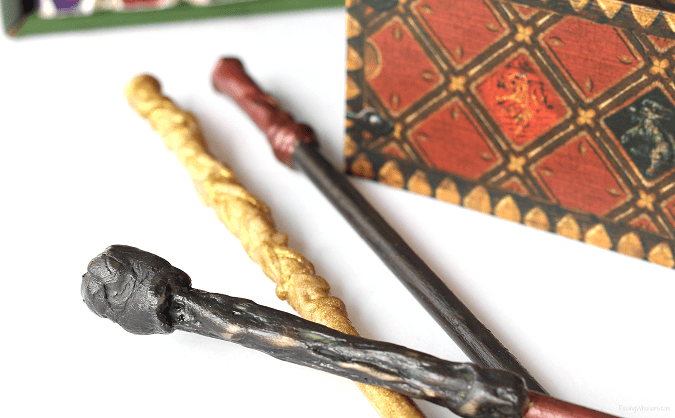 Don’t forget to make your own Easy Harry Potter Wands DIY for Under $2 each, the perfect party favor! May contain commissioned links. My son wanted a Harry Potter birthday party for his 9th birthday. I know, I couldn’t be more proud. But creating a birthday party based on one of the most epic book and movie series EV-AH…not an easy feat, especially when you’re a crafty Type-A perfectionist with about 1 million amazing ideas. But travel and a crunched time frame forced me to focus on the absolute Harry Potter birthday party must haves. 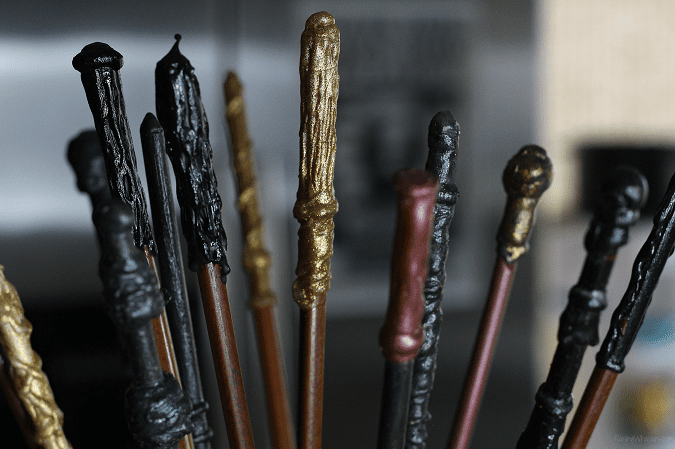 Case in point – wands. You cannot have a party without the wands. It all begins and ends with good chopsticks. Yes, chopsticks. Did you know that Asians use long cooking chopsticks for their big ole pot steaming, stewing and souping? But if you take a closer look these extra long cooking utensils actually have a more magical purpose in life. But it’s all in picking the right ones. Long Cooking Chopsticks – about 15 inches long with round body and pointed ends. I suggest ones that are NOT pre-painted/glossed. The handle of a Harry Potter wand makes or breaks this tutorial. So I suggest using Google as your friend to pull up a few pictures of wands as your go-to. Some are easier to recreate than others – Harry’s is pretty easy, as well as Draco, Ron and Bellatrix. But more complicated designs like Dumbledore and Hermione will need a bit of practice. Choose an easy design to start with and work up to to the harder ones, or get creative and create your own designs. 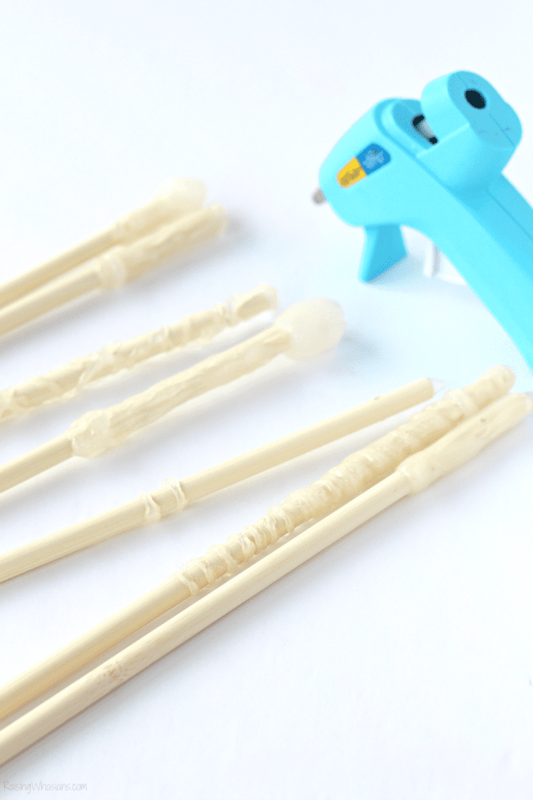 Add hot glue in the design of your wand to the handle portion of your chopstick. Allow to dry in between coats, especially with the thicker areas. You’ll definitely need some patience as you work with the glue. You may need to use your fingers to shape the glue a bit as it gets cooler. When fully dry, paint the wands your desired color. 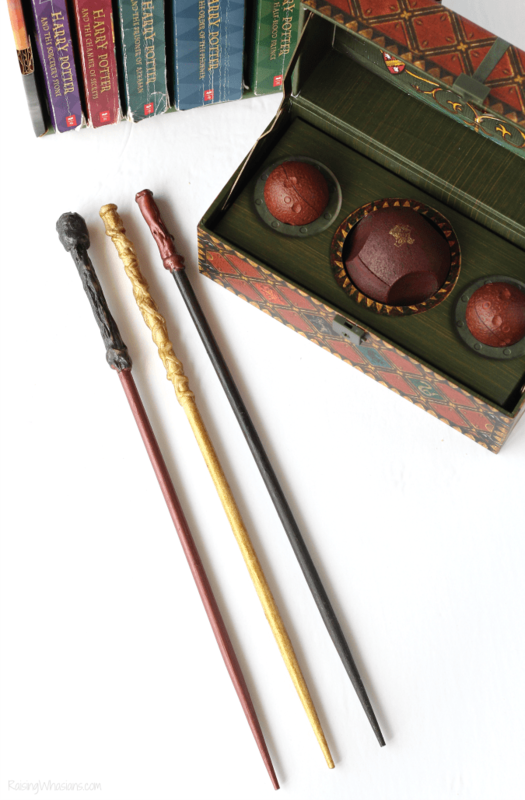 I loved accenting the wands with a touch of gold paint to give them an older/distressed look. Plus the girls went nuts for the glittery ones. Allow to dry. For the finishing look, give your wand a good coat of modge podge gloss finish. It gives it that perfect shine (no sticky paint) and feels more like the real thing. My biggest tip for making these wands is to make sure you have a few extra chopsticks handy. 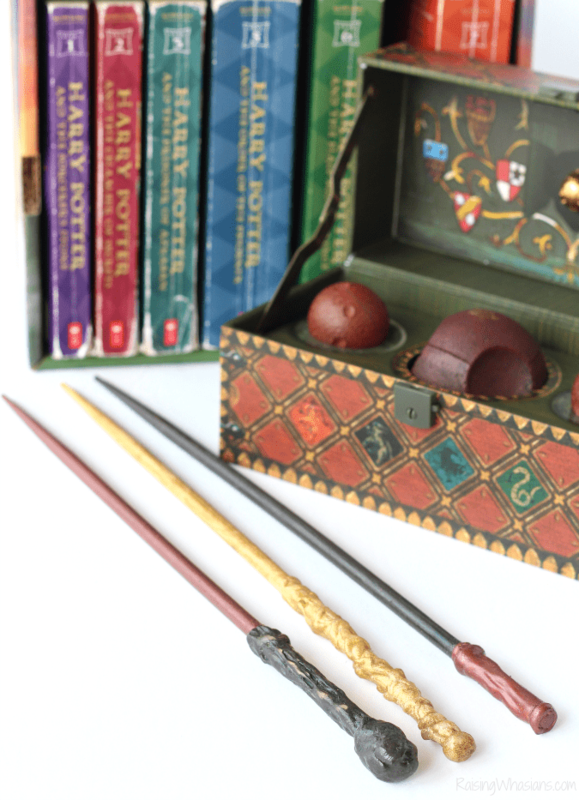 It’s definitely a learning process for this Easy Harry Potter Wands DIY. Allow yourself some creativity lenience. Also making sure you have your next glue stick on-hand definitely helps to move the process along quicker. I was super happy with the way these wands came out, and honestly the kids (and adults) all thought they were real! BOOM. 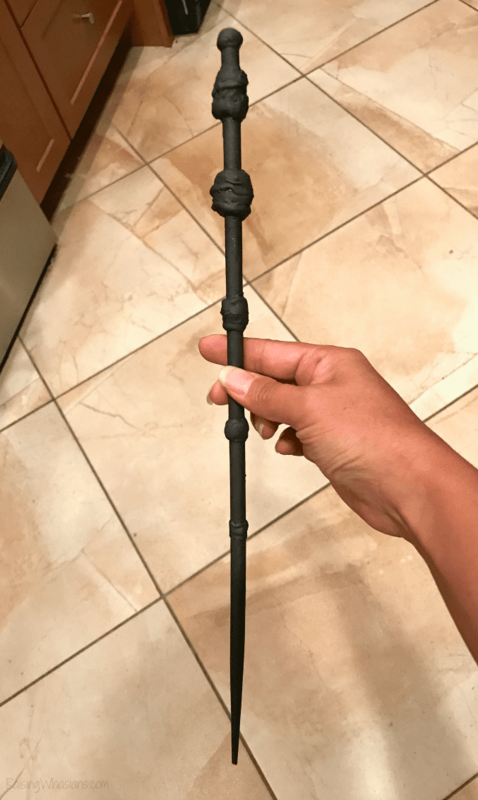 The best Harry Potter birthday party favor ever, my kids still love spell dueling with their wands to this day. 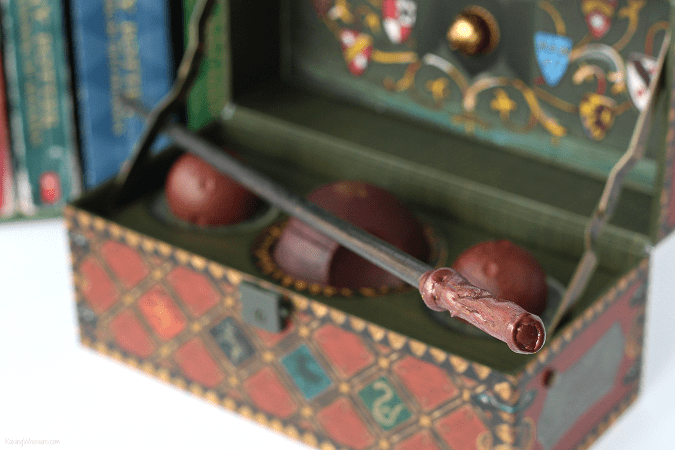 These Easy Harry Potter Wands were such a hit – definitely a keepsake for every Harry Potter fan. 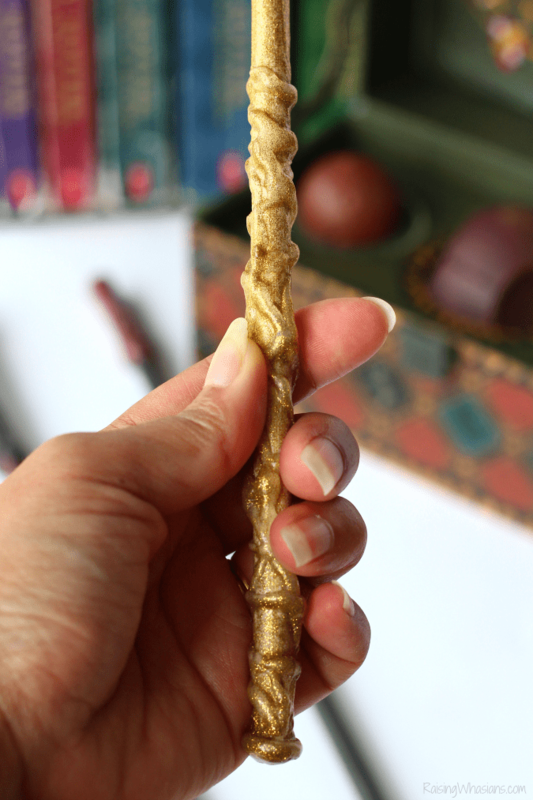 What do you think of this Easy Harry Potter Wands DIY for Under $2? Would your kids love them too? What did you use to make the handles exactly? The handles are literally the hot glue formed on top of the chopsticks. I linked the hot glue I used in the post. What kind of paint did you use exactly? Just an acrylic gold paint. The main thing is to allow to dry and then do a layer or two of Mod Podge over top to seal it. How long does it take for the paint to dry? I want to offer this activity at a 1 1/2 hr event with the wands the hot glue pre-made in advance for participants. Depends on the brand of paint you use. You could try to hair dryer them to make the process faster. But you’ll want to mod podge it after that. I am using this website to make wands for my child’s goodie bags of or her birthday! Thank you guys so much!